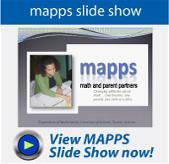 MAPPS – Math and Parent Partners | Changing attitudes about math…one teacher, one parent, one child at a time. We continue to set up programs across the country in both small and large school systems. Teachers love not only the parent participation but the dramatic results after implementing a MAPPS program.We welcome your inquiries and invite you to explore our website. If you have any questions about the program, we’d be happy to set up a convenient time to discuss all the details. Simply go to our contact page and send us an email or give us a call.